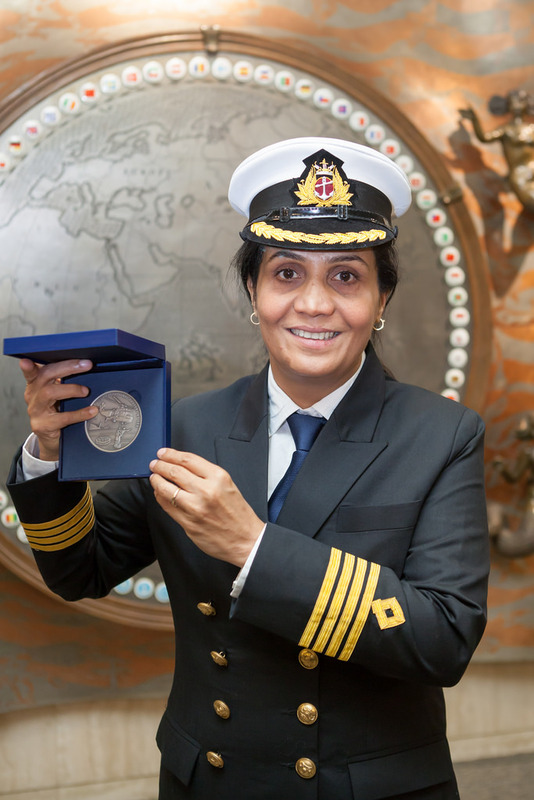 For being the first woman in the Indian Merchant Navy to receive the Bravery at Sea award…. Goddesses are real. At least, that’s what seven fishermen from Odisha believed when Captain Radhika Menon appeared to them amidst lashing winds and heavy rains, as they lay waiting for certain death. These fishermen, aged between 15 to 50 years, had taken their nets to the sea one stormy morning, underestimated the severity of the rain, and found themselves drifting way off course due to an ill-timed engine failure made worse by the loss of anchor. The food and water stowed in their boat had been washed away and they were surviving only on ice from the cold storage. That’s when they were spotted by the second officer on the Sampurna Swarajya who immediately reported the matter to Menon. The valiant captain wasted no time in organising a rescue mission, braving wave heights of over 25 feet, coupled with torrential downpours and winds of more than 60 knots. She also displayed a rare calmness in the face of calamity, making astute use of the pilot ladder, with life jackets and buoys on standby to deliver the fisherman to the safety of the ship. For this, she was rightfully bestowed with the Bravery at Sea award by the International Maritime Organisation making her the first woman captain in the Indian Merchant Navy to receive the honour.